SUMMARY: Crossed the border to Indiana! Another flat tire (#8) and Melody (who is very tired) chats with a woman who preps the breakfast at the hotel is a doula (among other things) on the side. MARK: A couple of quick updates from Indiana. The people have been kind and sweet. I’ve never had so many people wave to me from their cars and trucks. Whether coming toward me (the one- or two-finger way from the steering wheel) or once past me with a quick wave from inside the car — or out the car window or sunroof. I feel very welcome here so it’s a shame our stay isn’t longer. But the journey continues and Indiana is but a bump in the road from Oregon to Delaware. A bump we’ll roll over sometime tomorrow (Saturday). MELODY: Okay, I admit it. I’m tired. I have lost all of my underwear and my favorite scarf. My wrists hurt. My back hurts. Sometimes my toes are numb. I’ve been filming almost every day for about two months. The person I am filming (my husband) keeps telling me to turn the camera off. The GoPro doesn’t work anymore. I’m sick of living out of our small car. Mark is getting fit and I am getting fat. I’m exhausted. But then I met this lovely woman who prepares breakfast at the Comfort Inn in Renssalaear. Melinda is one of those people who can make anyone smile. 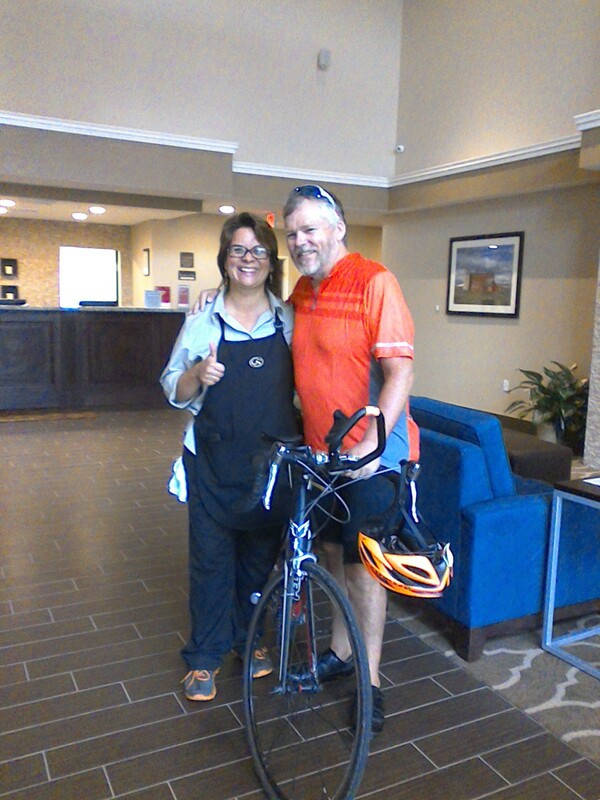 She was over-the-moon excited about Mark’s x-country biking trip and wanted to have her picture taken with him because she was so inspired by what he is doing. After he took off to ride toward Ohio, Melinda told me that she has Lyme disease and was in bed for 4 months. Now she is back up and working but it hasn’t been easy. Yet, she didn’t stop smiling for hours. In addition to all the things she does, she is also a survivor of domestic violence. This woman. She has been through so much and yet she spreads joy wherever she goes. Melinda is happily remarried now and has a son with her new husband. 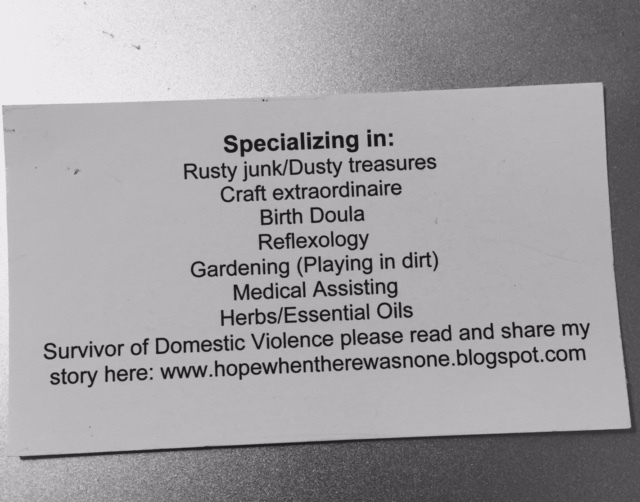 When I asked her which of the things on her card makes her feel most alive, she said being a doula. “Helping to bring a life into the world is what makes me feel alive,” she said. A few days ago she got to attend the birth of her grandson. “I am so lucky that I could offer physical and emotional support for my daughter as she gave birth to a new life,” she added, smiling. And then she went back to mopping the floor. BLUSH! You are too kind! Thank you for your warmth and kindness! I shared your story with my family and friends! I am so happy I had the chance to meet you both! Love your update Melody! Melinda makes me smile!